A group of us — Jennifer Bryant, Eva Seidelman, Tracy McCurty, Adwoa Masozi, Silvia Salazar, Melody Webb, and a few others — have been meeting over the last year to create a worker cooperative incubator called Cooperation DC. It will be housed in and fiscally sponsored by ONE DC, and will kick off with a training in November. On Friday November 6th, we’ll host two convenings — one is a training for small business support organizations so they’re able to include worker cooperatives in their offerings. Another is a convening with government and funders to get the national worker coop movement and our asks on their radar. If you have any suggestions for folks who should be at either of those, please reach out. On Saturday November 7th, there will be a training for current and potential worker owners. It’ll include financial planning, governance, management structures, financing, and legal. 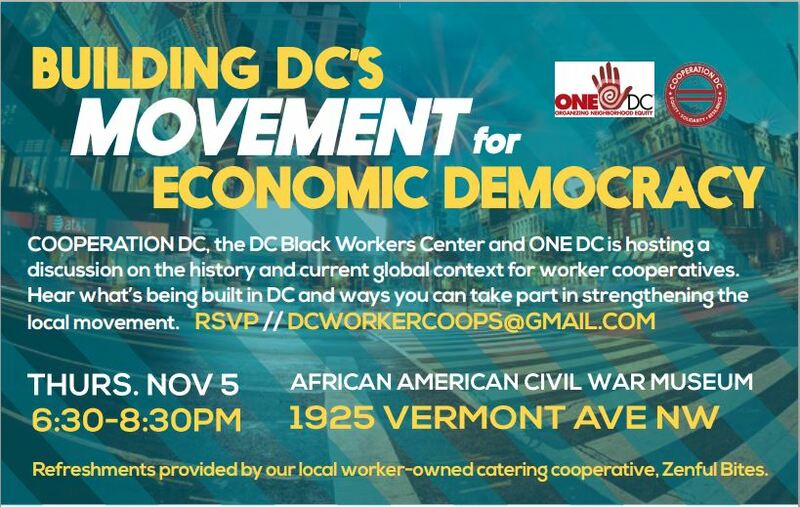 If you know of worker cooperatives in formation who may be interested in attending, please reach out to DCWorkerCoops@gmail.com with details. 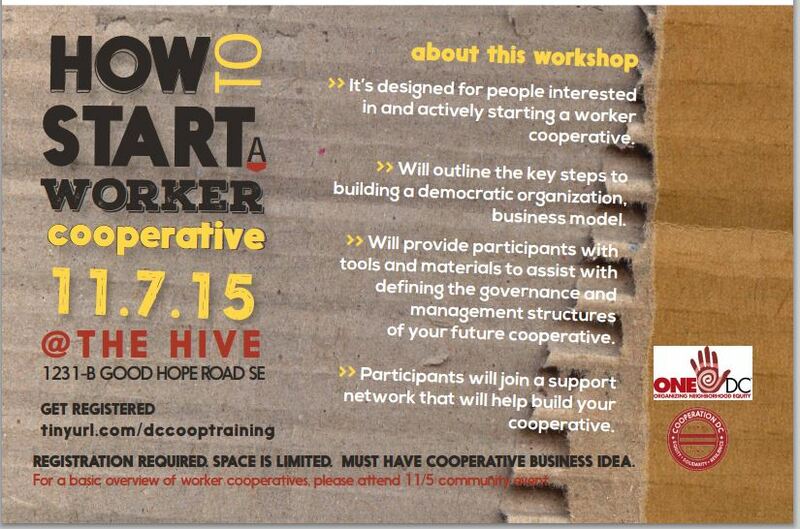 This one is not a worker coop 101 space — we’ll cover that base at the Thursday event! We’re raising funds over the coming months to pay for the training and the follow up technical assistance. If you have suggestions for potential funders or donors, or if you can chip in a little yourself, it would make a huge difference in us being able to do this work! Since the website for Cooperation DC would include many of the same resources on the Coop DC website, we’d like to merge the sites. That would mean that our web developer (Adwoa) would take what’s on the Coop DC page, put it on a fancy wordpress template, add information about the upcoming training, and change the domain to cooperationdc.org/com. Cooperation Jackson isn’t strictly worker coops, and likewise, it would be great to keep our other solidarity economy (housing coops, for instance) resources on there. Johanna, who’s been doing most of the blog updating, offered to continue doing what she’s doing on the new site, which is wonderful.